We are not alone. every square inch of our internal and external body surface is populated by a rich and diverse microbial community. Our mouth is not an exception. In fact it is estimated that each milliliter of saliva may contain about 100 million microbial cells, and over 700 bacterial genera have been described in this niche. 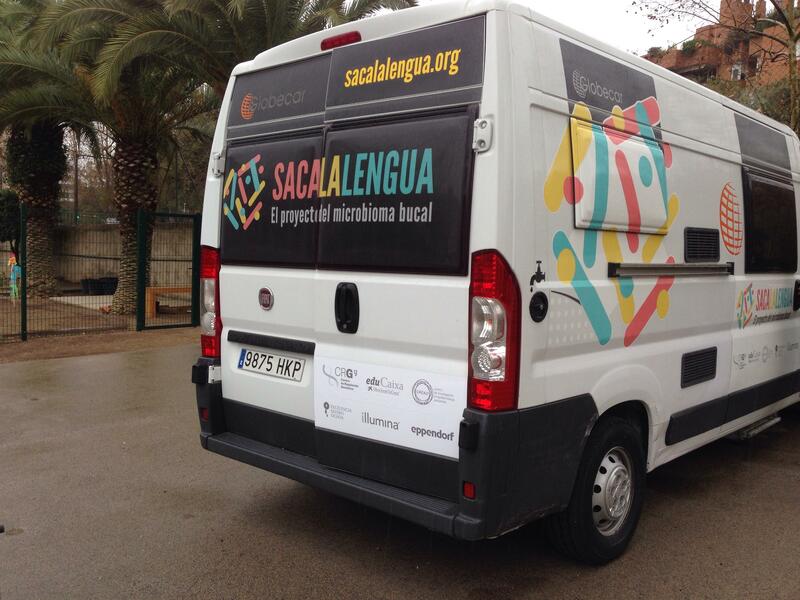 Identifying the composition of the oral microbiome in adolescents and how it may change with varying dietary and higiene habits was the main research purpose of the “Stick out your tongue” project (http://www.sacalalengua.org). One particularity of this project is that we took a citizen-science approach, aiming to involve citizens in all steps of the research, from hypothesis generation, through sample collection, to data analysis and interpretation. This approach has enabled us to access a large number of samples and data from a so-far poorly studied population (healthy adolescents) and also to contribute to the empowerment of our citizens in scientific issues. Our results show, for the first time, a relationship of variations in the oral microbiome with the chemical composition of tap water. In addition, many other relationships with dietary and hygiene habits are related. Living in a rural or densely populated environment, in contrast, seemed to have very little effect. 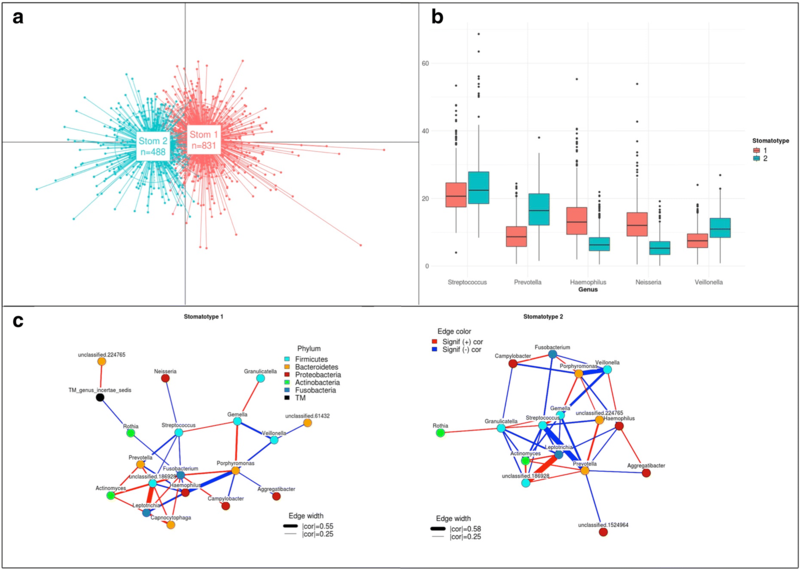 Overall, we found that the microbial diversity found in the oral cavity of adolescents belonged to two main "ecotypes" (which we named stomatotypes) that seem to represent two different possible equilibria between microbial communities and our mouths. The fully-equipped van that went all over Spain. Willis JR, Gonzalez-Torres P, Pittis AA, Bejarano LA, Cozzuto L, Andreu-Somavilla N, Alloza-Trabado M, Valentin A, Ksiezopolska E, Company C, Onywera H, Montfort M, Hermoso A, Iraola-Guzman S, Saus E, Labeeuw A, Carolis C, Hecht J, Ponomarenko J & Gabaldon T 2018, 'Citizen science charts two major "stomatotypes" in the oral microbiome of adolescents and reveals links with habits and drinking water composition', Microbiome, 6, 218. Fluorescence microscopy is one of the most powerful tools employed in life sciences as it allows imaging of different molecular components in cells with high specificity and sensitivity. 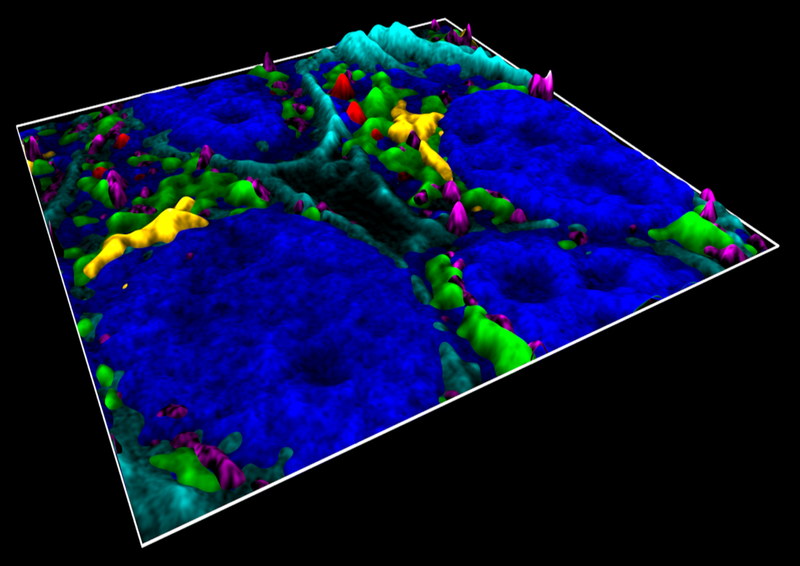 With the advent of super-resolution microscopy, the possibility of visualizing cellular structures at the nanoscale is now within reach. Therefore, the next grand challenge in biology aims at deciphering spatiotemporal molecular interactions within supramolecular complexes and/or sub-cellular organelles. Although molecular interactions play a vital role in diverse cellular functions, so far they have been poorly addressed as fluorescence microscopy is limited in the number of different labels that can be distinguished simultaneously. In 2018 we developed a new approach for simultaneous multicolour confocal or multicolour super-resolution microscopy that overcomes current challenges in fluorescence imaging and dramatically increases image acquisition time. The method relies on the absorption spectra of fluorescence probes instead of their fluorescence emissions. The method is based on multiplexing optical excitation signals in the frequency domain using single colour-blind detection. Since the spectral information is fully encoded during excitation, the method enables the simultaneous identification of multiple colour channels in a single measurement. We first implemented the method in a confocal configuration and demonstrated simultaneous imaging of six spectrally- and spatially-overlapping fluorophores on fixed cells using four excitation wavelengths. In the case of super-resolution microscopy, we implemented the method in two single molecule localization modalities: DNA-PAINT and STORM. We showed that frequency-multiplexed DNA-PAINT acquires multiple colours at the same time as single-color DNA-PAINT, dramatically improving image acquisition time without compromising the field-of-view or signal throughput. Our new methodology is fully compatible with live cell imaging and as such it will open up wide-ranging opportunities for exploring the molecular mechanisms that underpin supramolecular and/or organelle interactions in living cells with unprecedented levels of detail. E.T. Garbacik, M. Sanz-Paz, K.J.E. Borgman, F. Campelo, M.F. Garcia-Parajo. Frequency-encoded multicolor fluorescence imaging with single-photon counting color-blind detection. Biophys. J.115, 725-736 (2018). Highlighted in Nature Methods. P. A. Gomez-Garcia, E.T. Garbacik, J.J. Otterstrom, M.F. Garcia-Parajo* & M. Lakadamyali*. Excitation-multiplexed multicolor superresolution imaging with fm-STROM and fm-DNA-PAINT. Proc. Nat. Acad. Sci. USA115, 12991-12996 (2018). * Equally contributing authors. The group lead by García de Abajo have explored the ability of two-dimensional periodic arrays of atoms to produce light amplification and generate laser emission when optical gain is introduced in the system by means of external illumination (i.e., an optical pump). Specifically, they have predicted that light emission of a laser type can take place for arbitrarily weak atomic scatterers (i.e., regardless of how weak is the interaction between light and the atomic transition used for the laser emission), assisted by cooperative interaction among atoms in a 2D periodic lattice. They have based this conclusion on analytical theory for three-level atoms, which additionally revealed a rich interplay between lattice and atomic resonances. Lattice resonances are well known in optics and lie at the heart of widely known phenomena such as the Wood anomalies and extraordinary optical transmission (i.e., funneling of light through arrays of small holes). 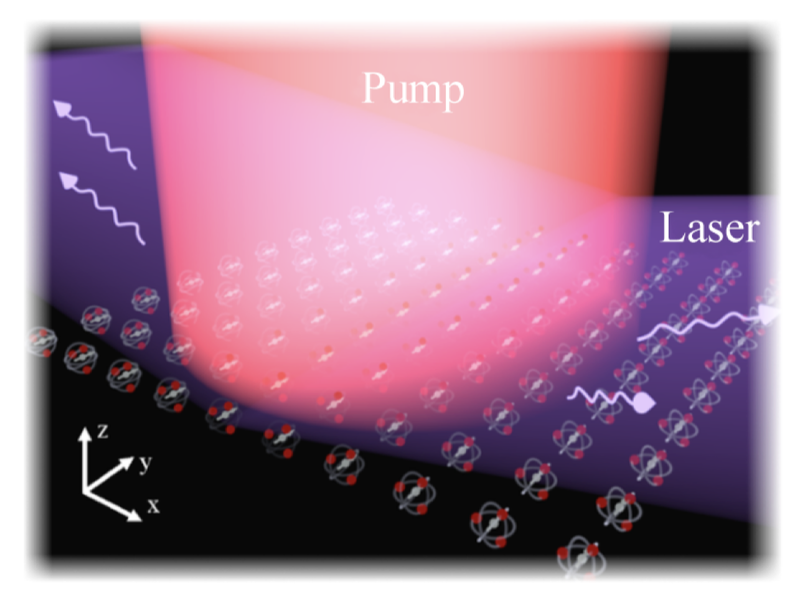 Their results should provide a general background to understand light amplification and emission of laser light in periodic atomic arrays, with promising applications in the generation, manipulation, and control of coherent photon states at the nanoscale. Illustration of a periodic atom array that is optically pumped, giving rise to lasing emission. This system forms a laser in which optical gain is produced by the pumped atoms, while light amplification takes place in an unusual cavity formed by the lattice resonances of the system. Physical Review Letters 121, 163602. Cellulose and its derivatives have gained renewed interest as favorable alternatives to conventional plastics, due to their abundance and lower environmental impact. Cellulose is probably the most interesting biopolymer because it is abundant on Earth and for centuries has had a wide technological relevance in areas such as textiles, packaging and knowledge storage. Cellulose is a polysaccharide that results from the repetition of glucose units. It consists of fibers with dimensions of 2 to 4 mm in length and 2 to 200 microns in diameter. By appropriate processing it is possible to obtain cellulose nanoparticles which form nanocellulose. The typical arrangement of cellulose microfibers scatters light diffusively, providing the well-known white color of paper. Nanocellulose instead can form compact and transparent films or colorful optically active ones, depending on the amorphous or crystalline arrangement of the nanoparticles. Hydroxypropyl cellulose (HPC) is just a nanocellulose derivative which is water soluble and particularly suitable for soft imprinting methods. We succeeded for the first time to fabricate photonic and plasmonic structures by molding hydroxypropyl cellulose into sub-micrometric periodic lattices, using low-cost soft lithography. This is an alternative way to achieve structural color in this material (see Fig. 1). Cellulose-based photonic crystals are biocompatible and can be dissolved in water or not, depending on the derivative employed. Patterned cellulose membranes exhibit tunable colors and may be used to boost the light emission properties of a host organic dye. Furthermore, we demonstrated how metal coating these cellulose photonic architectures leads to plasmonic crystals with excellent optical properties acting as disposable surface-enhanced Raman spectroscopy (SERS) substrates for ultra-sensitive optical characterization. Essentially, we proposed an alternative route to easily provide cellulose derivatives with an optical functionality, enabling the fabrication of cellulose-based two-dimensional photonic structures with sub-micrometer features with great potential in a variety of photonic applications, as illustrated in Fig. 2. Fig. 1: (a) Photographs of the cellulose photonic films (square lattice of imprinted cylindrical holes) with different lattice parameters. Square lateral size is 1 cm. 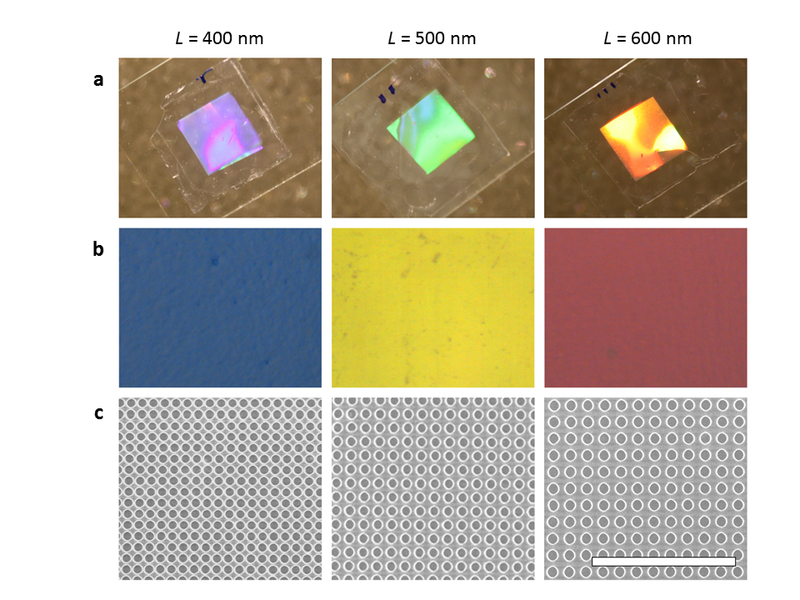 (b) Images of the cellulose photonic films acquired with an optical microscope, exhibiting bright, well-defined colors. (c) SEM micrographs of the cellulose photonic films (top view). Scale bar, 5 microns. Fig. 2: Examples of free-standing cellulose photonic-crystal films fabricated by soft nano-imprinting lithography in our lab at ICMAB. 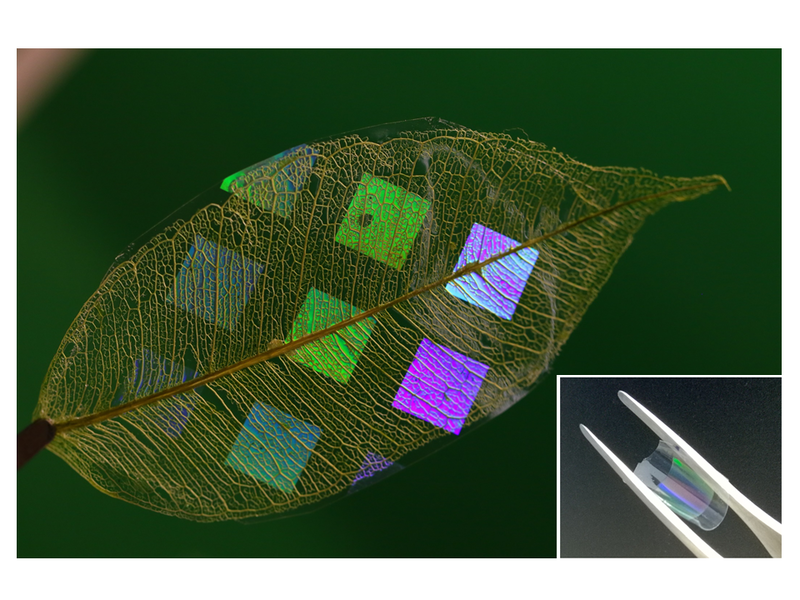 The pictures demonstrate the high flexibility and versatility of the cellulose photonic films, as illustrated by the decorated leaf. Espinha A, Dore C, Matricardi C, Alonso MI, Goñi AR, Mihi A 2018, 'Hydroxypropyl Cellulose Photonic Architectures by Soft Nanoimprinting Lithography', Nature Photon. 12, 343-348. The efficacy and tolerability of anticancer drugs are limited by their side effects. Controlling the activity of these drugs in space and time would allow improving chemotherapy treatments, and light-regulated drugs are well suited to this purpose. We have developed phototrexate, the first photoswitchable inhibitor of the human dihydrofolate reductase (DHFR), as an analogue of methotrexate, a widely prescribed chemotherapeutic drug to treat cancer and psoriasis. Quantification of the light-regulated DHFR enzymatic activity, cell proliferation, and in vivo effects in zebrafish show that phototrexate behaves as a potent antifolate in its photoactivated cis configuration and that it is nearly inactive in its dark-relaxed trans form. 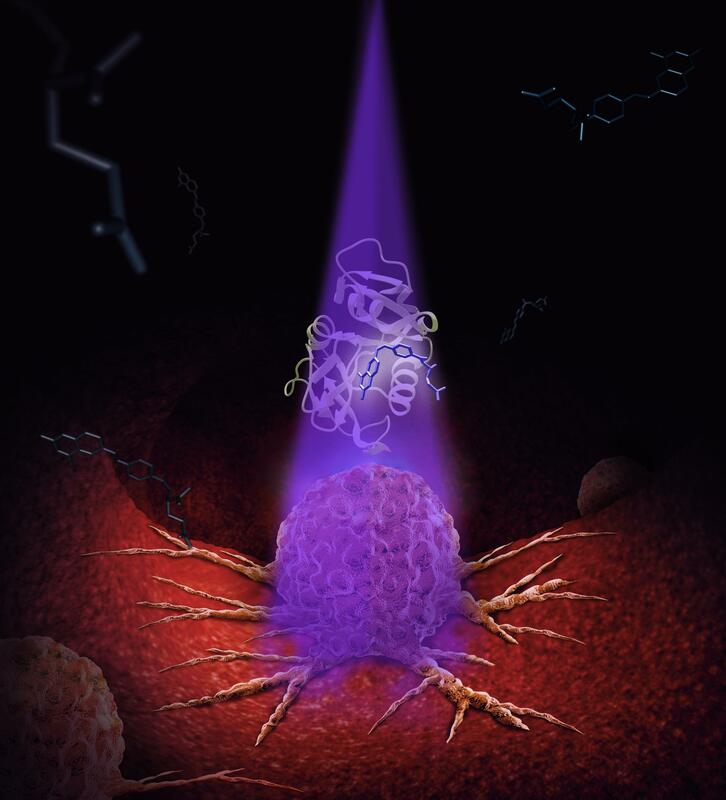 Thus, phototrexate constitutes a proof-of-concept to design light-regulated cytotoxic small molecules and a step forward to develop anticancer chemotherapies with localized efficacy and reduced adverse effects. Methotrexate (orange) gets stuck in the active site of an important protein (DHFR) and is widely used as anticancer drug despite its side effects. The newly developed Phototrexate can inhibit DHFR under illumination (violet) and is nearly inert in the dark-relaxed form (blue). Phototrexate is a compound that inhibits an important protein (DHFR) under illumination and acts as a light-activated anticancer drug. Matera C, Gomila AMJ, Camarero N, Libergoli M, Soler C & Gorostiza P 2018, 'Photoswitchable Antimetabolite for Targeted Photoactivated Chemotherapy', J. Am. Chem. Soc., 140 (46), pp 15764–15773. Despite the importance of electron transfer between proteins in photosynthesis and cellular combustion, the electric current between partner proteins has never been measured as a function of their separation in water. Here, we use electrochemical tunneling spectroscopy to show that the current between two protein partners decays along more than 10 nm in the solution, ten times farther than expected. Computer simulations reveal that water is "desalted" between the proteins, which causes an extended electric field. Proteins could use this long distance current mechanism in order to interact specifically but not strongly, thus keeping high turnover rates in the crowded environment of cells. Computer simulations of protein partners hCc (left, orange) and pCc1 (right, green) indicate that water is "desalted" between the proteins, which causes an extended electric field. Heme groups are highlighted in each protein. Image credit: Alba Nin-Hill. Lagunas A, Guerra-Castellano A, Nin-Hill A, Díaz-Moreno I, De la Rosa MA, Samitier J, Rovira C & Gorostiza P 2018, 'Long distance electron transfer through the aqueous solution between redox partner proteins', Nat Commun. 9(1):5157.